"You used an em dash instead of a semi-colon. Our interview is off!" I really did feel a sort of amateur's hesitation when even thinking of approaching the guy. And that's even knowing someone (Hunter Bennett from Dot Dash) who played in David Thomas' band briefly a few years back. But, in all honesty, there was no way I was not going to try my hand at a few interview questions when I learned that Thomas was game as he promotes the amazing and essential new Pere Ubu box set, Elitism For The People 1975-1978, out in a few days on Fire Records. Not only was David Thomas gracious but he didn't even rebuke me when I made a stupid guess about Dub Housing (1978). I really appreciate that. I also appreciate his time and genius. Now, here are my "5 Questions with David Thomas of Pere Ubu" conducted via email last week. Glenn Griffith, kenixfan: In the era covered by the excellent and essential Elitism for the People 1975-1978 box set, how aware were you in Pere Ubu of your place -- if you had one -- in the punk or new wave scenes of the era? The music seems, more than ever, outside of anything being made, certainly in the USA, at the time, and it's probably a stretch to lump Pere Ubu in with other acts from the same time period. Glenn Griffith, kenixfan: One gets a sense, especially when listening to Dub Housing now, that the tracks were expansions of material worked out in live settings -- it sounds like a recording of a performance, in spots. How did you approach recording in a studio in that era? How did the live performances shape what you brought to the studio and how did your studio time and the experience of making albums change the live shows back then? David Thomas of Pere Ubu: Dub Housing was actually much more of a record composed in the studio than Modern Dance. After Modern Dance we had used up most of the stuff we knew. Modern Dance had all been material worked up live except maybe "Chinese Radiation" which we had played once or twice - I played congas on it at the Pirate's Cove residency the one time I remember! "Humor Me" had been written a few weeks before the session but not played out. The first real run-through is on the 390 Degrees record. We were very efficient in the studio - studios were expensive. All the singles had been recorded and mixed, both sides, in three hour sessions... max. Some of Modern Dance was remixes of the singles ("Modern Dance" and "Street Waves") or sides we'd recorded for single release that hadn't actually been released - "Nonalignment Pact". When we went in to the studio to finish Modern Dance, we worked as quickly as we did for the single sessions. The band and songs were the same on stage and in the studio though "Sentimental Journey" had gone through a major deconstruction by the time we recorded it. Glenn Griffith, kenixfan: Why now for this box set and why such a narrow range? Are you worried that by looking at only 3 years, new fans will not see the achievements of the other 37? David Thomas of Pere Ubu: We signed to Fire Records recently and brought the catalog. Fire's intentions are to go thru the years via box sets. I am now working on the next one covering 1979-1982, tentatively titled The Architecture of Language. Glenn Griffith, kenixfan: Pere Ubu always seemed like a more holistic, for lack of a better word, act than Captain Beefheart and His Magic Band, despite some general stylistic similarities. How have you maintained such cohesion over the course of 40 years leading various versions of Pere Ubu? David Thomas of Pere Ubu: Pere Ubu is an idea. That idea is unchanged by even an iota. There are rules that fix that idea. We don't make the rules - we obey them. Glenn Griffith, kenixfan: What inspires you? What drives you to continue Pere Ubu? What are the new possibilities, or new challenges, you face as a band-leader in 2015? David Thomas of Pere Ubu: I am driven by an overwhelming sense of failure and the need to get it right - just once. I offer my sincerest thanks to David Thomas for his time in conducting this interview. And enormous thanks to Alice at Fire Records for arranging this. Elitism For The People 1975-1978 is out on Friday. 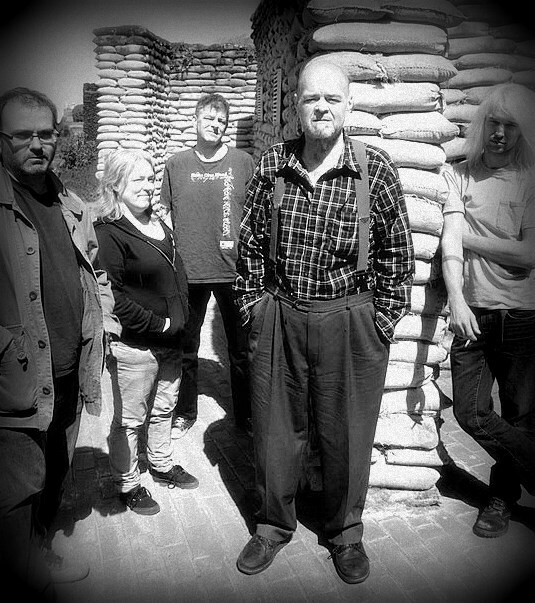 Follow Pere Ubu via The Ubu Projex.